Happy Easter! I hope everyone had a nice break, lucky for us in Australia we got a 5 day break, so there were enough days to relax and get some odd jobs done. My break started in Yanchep which is about an hour North of Perth. Some would argue that it is still Perth, but I’m going to say it isn’t. When you’re driving an hour away from the place you live, it naturally becomes ‘another world’. Regardless, a small group of us hired a house on the beach and spent three days relaxing, eating, drinking, playing poker, and indulging in a couple of TV marathons – The Only Way is Essex, and Friends. Yep, quality. Monday morning my boyfriend Colin and I drove back to Perth for Easter breakfast with my family. It was yesterday, Tuesday, where the productive part of the break took place. My brother, Colin and I built a new gate for my house. Seemed easy enough – new gate, couple of posts, screw some stuff in, put on a latch, easy. Yeah, no. 6 hours later, three trips to Bunning’s and one trip to the parents to borrow gear, and I have a new gate! Painting will take place next weekend. In the midst of this, I made Carrot Cupcakes. I made these last Easter as well (original recipe here), so they have become my new tradition, along side of my Individual Chocolate Pavlovas with Cream and Marinated Strawberries I make for Christmas – yep, you have 8 whole months til you get that recipe! I really like these cakes. The icing on them is by far the best cream cheese icing because it isn't overly sweet or sour (from the cream cheese). The cake is subtly spiced so there is a great balance. Preheat the oven to 175°C. Line a muffin tin with cupcake cases. In a bowl, sift together the sr and plain flour, bicarb soda, spices and sugar, and stir. In a smaller bowl, add the oil, eggs and yoghurt and mix until all ingredients are combined. Pout the oil mix into the flour mixture and fold together. Add the grated carrot and fold again. Spoon the mix into the paper cases until 2/3 full, and bake in the oven for 20 minutes or until cook through. Use a skewer to see if they are done. To make the icing, beat the cream chese, butter and golden syrup until well combined. Sift in the icing sugar then continue beating until the icing is light and fluffy. 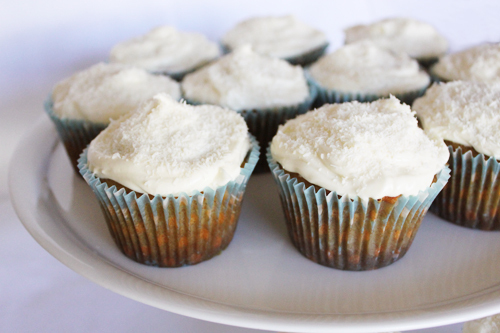 Generously top the cupcakes with the icing, and sprinkle on the coconut to finish. I made these cupcakes for Mother's Day and they were so moist and fluffy and not too sickly sweet. The Mums loved them! Plus they're made from carrots, so they're good for you :) Thanks for the recipe Tash!